Deleting SCVMM 2012 R2 Logical Network Definitions with PowerShell. | Chinny Chukwudozie, Cloud Solutions. ← My Step-by-Step DirectAccess Configuration on Windows Server 2012 R2. Deleting SCVMM 2012 R2 Logical Network Definitions with PowerShell. 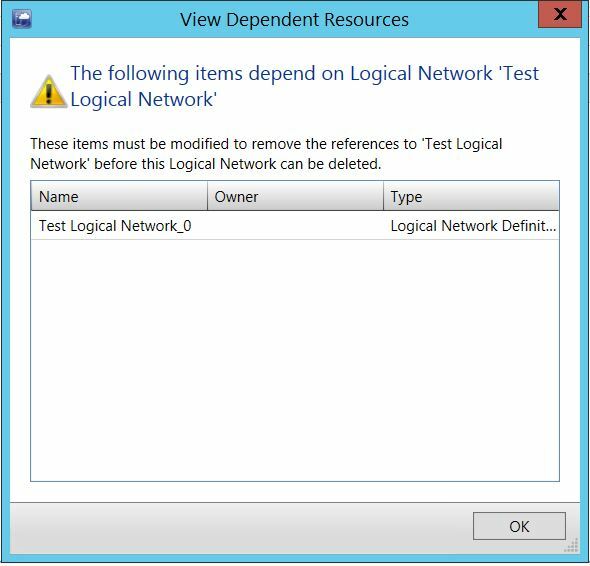 Attempting to delete a SCVMM 2012R2 logical network throws an exception as shown in the screen shot below because there are other dependencies like the Port Profiles, logical switches and other network objects still depending on it. The “View Dependent Resources” page displays the current Logical network definition dependencies preventing the Logical network from being removed. We can remove the network definitions with PowerShell after which we delete the logical network. Running the Get-SCLogicalNetwork -Name "Test Logical Network" doesn’t return any value. This confirms the removal was successful. This entry was posted in SCVMM2012R2, System Center 2012 R2, VMM2012R2, Windows Server 2012 R2 and tagged Cmdlets, Logical Network, Logical Network Definitions, Network Sites, SCVMM2012R2, SCVMM2012R2 Dependency. Bookmark the permalink.